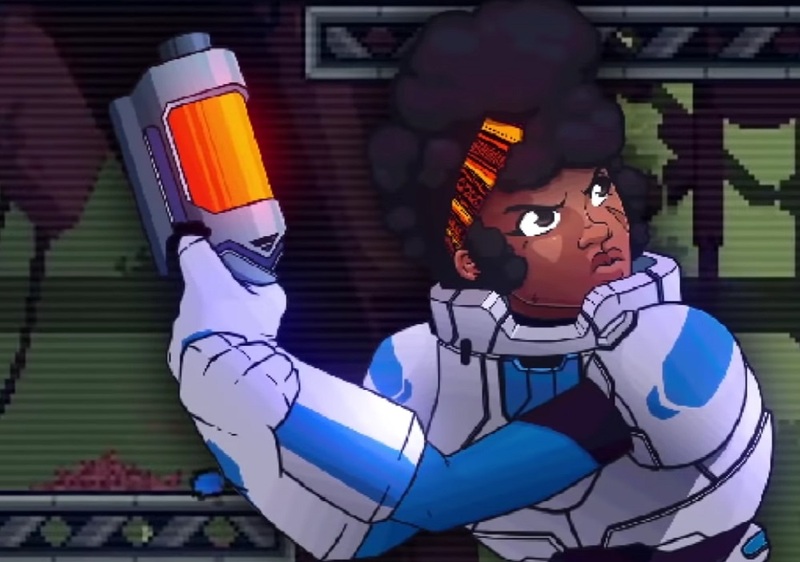 A new 2D arena shooter is headed to PS4, PC and Xbox One courtesy of Brazilian indie kids Studica Studios. Gravity Heroes is a 2D platform shooter where every ceiling, every wall, every surface is a floor. Set in a near-future, where man and machine live in tranquil harmony, a sudden and seemingly motiveless revolt takes place, with the world's synthetic populace turning on its flesh friends. You are one of the Gravity Heroes, a crack team dispatched to get to the root of the problem, battling your way through the uprising and uncovering the mystery behind the civil war. As you can see from the trailer above, Gravity Heroes features 16-bit style visuals and sound, somewhat reminiscent of early '90s Amiga titles. Players must shoot it out against the enemy in topsy-turvy, single-screen battles, utilising weapons, power-ups and clever movement to outgun 25 enemy types and a selection of bosses. When not blasting through the campaign mode, players can engage in competitive battles, fighting friends to prove yourself the true master of gravity (even though we all know it's actually Kat, right?) Gravity Heroes will launch this fall for PS4, PC and Xbox One.